Panorama Bulabog Bay - A HD livestream from the beach at the Red Coconut Beach Hotel. Muntinlupa: Weather in Muntinlupa - Villa Carolina, 175.7 mi. El Nido: El Nido Beach, 180.3 mi. Manila: Roxas Boulevard, 190.3 mi. Panglao: Alona Beach, 209.1 mi. Changhua: Weather in Changhua, 840.3 mi. Qing'ao (Nan'ao): Qing'ao Bay, 851.9 mi. Nan'ao: Nan'ao Island Green Bay, 852 mi. Hong Kong: View over Ocean Park and Aberdeen, 875.6 mi. 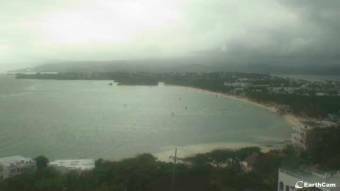 This webcam Boracay with the theme Seaview was added on August 20, 2015 and is operated by EarthCam. It got 821 visitors since then. Shouldn't this webcam work or should the link be wrong please report that here. You can add this webcam here to myCams.